I’ve been pretty fascinated with the Asian take on western style music during the ‘60s and 70s since stumbling onto Parallel World’s compilation, “Cambodian Rocks,” a few years ago. Since that time, there’s been a good amount of interesting comps popping up as good as the PW comp. Truly makes you hunger for more. Khmer Rocks has been putting out their series Cambodian Rocks, supplying song titles, artist names, and good background history in the liner notes – everything the Parallel World compilation completely left out. The KR versions are also the original songs; the Parallel World CD re-mixed them with massive overdubs of synthesizers and electronic drums -- something I’ve learned is done with a lot of Cambodian originals to keep them fresh and interesting for their youth. There’s also Subliminal Sounds’ “Thai Beat A-Go-Go” series, Trikont’s “Ho! 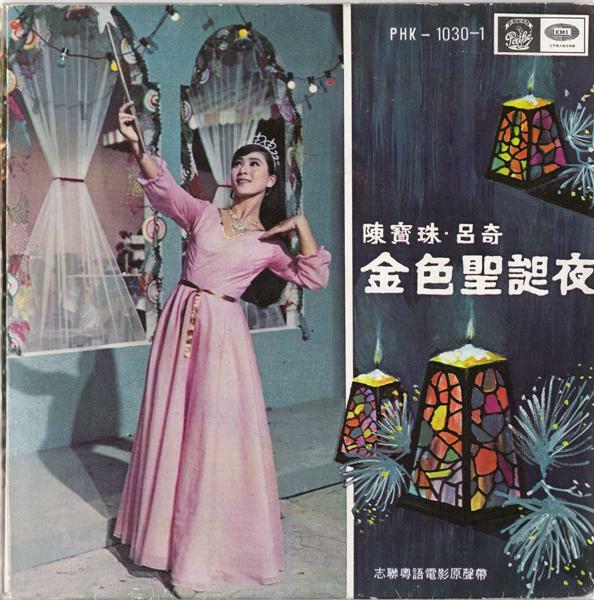 Roady Music from Vietnam,” Sublime Frequencies, “Radio Phnom Pen” and “Cambodian Cassette Archives,” and the out-of-print “Teenage Dance Music from China and Malaysia,” off of a label called Thrift Score. Basically, these are good times to be living in, because there’s a bunch of fine folks out there finding all this hard-to-find music from decades ago in another world and putting them out for us to consume, here and now. 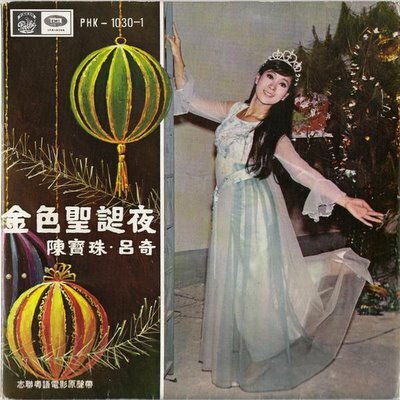 Sadly, I can’t tell you much about it, as any information on the record is in Chinese. There are eight songs, four on each record, and they’re all delicious and creamy Asian style holiday treats. You'll recognize Jingle Bells, of course, but it may take you a minute to figure out why Golden X'mas Eve sounds so familiar - it's the Victorian chart-topper "Daisy Bell," more famously known as the bicycle built for two song. Song titles are included in English, as are the album title (Golden X’Mas Eve) and artists – Chan Pao Chu and Lu Kay. I could find nothing on Lu Kay, but I did find a brief reference to Chan Pao Chu as an actress in Cantonese cinema through Google. If that’s her on the record cover, then I should hope to see these movies. I hope you enjoy the songs as much as I do, and if anyone out there knows anything about these two artists, feel free to let us know in the comments. This entry was posted on Thursday, December 22, 2005 at 12:00 PM. You can skip to the end and leave a response. I was surprised to discover your entry while googling for Connie Chan Po Chu. The soundtrack EP you have is for a movie called A Glamorous Christmas Night. It is available on DVD and VCD at YesAsia.com, but sadly without subtitles. For a review of the movie and more information about Connie Chan, check out my fan site, Moviefanprincess.com. You'll also want to check out the links page, which features a link to a discography with pictures of her albums.